EIA’s January 2019 Short-Term Energy Outlook (STEO) expects several U.S. natural gas market trends from 2018 to continue into 2019 and 2020, including relatively stable Henry Hub natural gas prices and increasing natural gas production and exports. EIA’s January 2019 Short-Term Energy Outlook (STEO) expects several U.S. natural gas market trends from 2018 to continue into 2019 and 2020, including relatively stable Henry Hub natural gas prices and increasing natural gas production and exports. According to the STEO, total U.S. natural gas consumption is expected to increase slightly through 2020, with increases in the electric and industrial sectors offsetting decreases in the residential and commercial sectors. 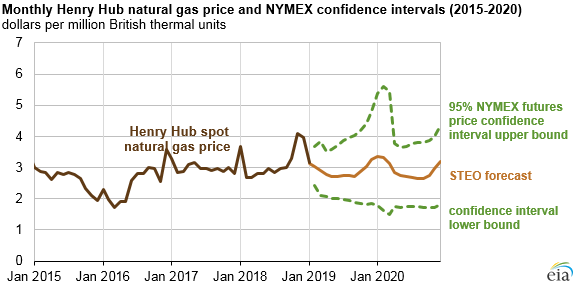 EIA expects the U.S. benchmark Henry Hub natural gas spot price to average $2.89 per million British thermal units (MMBtu) in 2019 and $2.92/MMBtu in 2020, about 25 cents lower than the 2018 average of $3.15/MMBtu. Prices in the forecast are expected to be comparable with recent years as production growth largely keeps pace with demand and export growth. NYMEX trading during the five-day period ending January 10, 2019, suggests that a range of $1.85/MMBtu to $4.80/MMBtu encompasses the market expectation for Henry Hub prices in December 2019 at the 95% confidence level. EIA expects record-high dry U.S. natural gas production to continue to grow through 2020, from an estimated 83.3 billion cubic feet per day (Bcf/d) in 2018 to 90.2 Bcf/d in 2019 and 92.2 Bcf/d in 2020. Most U.S. production will come from the Appalachian Basin in the Northeast, followed by the Permian Basin in western Texas and eastern New Mexico and the Haynesville shale formation in eastern Texas. Factors supporting continued production growth include improved drilling efficiency and cost reductions in drilling and well completions, as well as increased takeaway capacity from the highly productive Appalachia and Permian production regions. 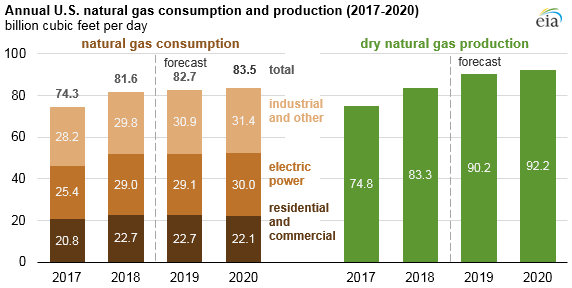 Total U.S. natural gas consumption remains relatively flat compared with 2018 levels in the STEO forecast, increasing 1.3% in 2019 and 1.1% in 2020 to a total of 83.6 Bcf/d in 2020. Natural gas consumption is projected to decrease slightly in the residential and commercial sectors, as expected milder weather will require less energy for space heating in the winter and air conditioning in the summer, largely based on temperature projections from the National Oceanic and Atmospheric Administration. Decreases in those sectors will be offset by increased consumption in both the electric power and industrial sectors, both of which have added equipment or changed processes to consume more natural gas. EIA expects a net increase in U.S. natural gas use in the electric power sector between 2018 and 2020 as natural gas-fired plant additions continue to displace coal-fired generation. During 2019, natural gas planned capacity additions will total 7.5 gigawatts (GW) in the United States, and 4.5 GW of coal-fired capacity will be taken offline. Natural gas will continue as the primary source of U.S. electricity generation, increasing from 35% in 2018 to 37% in 2020. According to the STEO forecast, coal-fired electricity generation will fall from 28% in 2018 to 24% in 2020. Natural gas consumption in the U.S. industrial sector will continue to grow, increasing 2% in 2019 and 1% in 2020. This growth will be supported by new methanol plants that use natural gas feedstock, and these plants are scheduled to come online in 2019 and 2020. EIA anticipates that the United States will continue to export more natural gas than it imports during the coming years as production continues to outpace domestic consumption. Most of the increase in natural gas exports will come from additional liquefied natural gas (LNG) capacity additions at the Cameron LNG and Freeport LNG facilities located along the Gulf Coast, and the Elba Island LNG facility in Georgia. EIA expects LNG exports to increase from an estimated 3.0 Bcf/d in 2018 to 5.1 Bcf/d in 2019 and up to 6.8 Bcf/d in 2020, more than double 2018 levels. Gross exports of natural gas by pipeline will continue to grow according to the STEO, increasing to 8.1 Bcf/d in 2019 and 8.4 Bcf/d in 2020, or 19% higher than 2018 levels. Most of the increase will be driven by increasing natural gas demand and pipeline projects in Mexico that are scheduled to come online by the end of 2020. Imports of LNG are expected to remain flat through 2020, and decreases in imports by pipeline will continue as Appalachian production and takeaway capacity displace Canadian natural gas in the U.S. Midwest markets.